A grueling backpacking trip to the Grand Canyon’s finest oases. Deep within the folds of the Grand Canyon, streams carve sinuous slots, canyon tree frogs sing, and ferns cling to mossy walls. The route to Thunder River and Deer Creek via the Bill Hall Trail grants access to some of these rare pockets of water. From the parking area, the trail climbs slightly along the rim to the tip of Monument Point. Steep switchbacks drop an initial 500 feet, with a brief reprieve as the trail contours northwest for a half-mile. A second set of switchbacks cuts through the Coconino Sandstone, and the knee-pounding grade continues until the junction with the Indian Hollow Trail at around 2.5 miles. The trail traverses across a bench of dimpled slickrock called the Esplanade. For the next 2.5 miles, watch for cairns as you head small drainages and pass excellent snack spots. Note: Consider stashing water here for your hike out. Be sure to label jugs with your name and date, and pack out the containers when you leave. 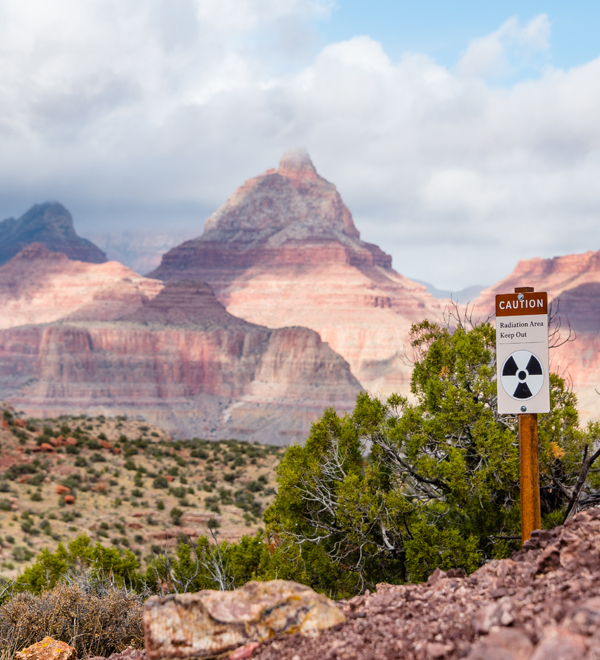 The easy walking ends when the trail plunges through the Supai and Redwall formations. Carefully pick your way down the loose switchbacks to the trail junction at Surprise Valley — left goes to Thunder River and Tapeats Creek, right to Deer Creek. Veer left (east) toward the Tapeats Creek drainage. As you near its edge, you can hear the rumbling of Thunder River before you see water gushing out of the Redwall Limestone. Mosses, ferns, and flowers cluster around the life-giving springs. Steep switchbacks lead down to Thunder River, where shade and mist from the cascading falls beg you to perch up and relax. To reach the upper campsite (AW7), continue down the trail to Tapeats Creek. It’s about a quarter-mile downstream from the confluence of Thunder River and Tapeats Creek. (Alternatively, if your permit is for the lower campsite (AW8), walk another 2.5 miles downstream to the Colorado River). Tapeats Creek is lovely and worth the extra miles to explore downstream. Consider leaving your pack at the upper campsite while you hike down to the Colorado River and back. At the upper campsite, cross Tapeats Creek to the trail on the east side. 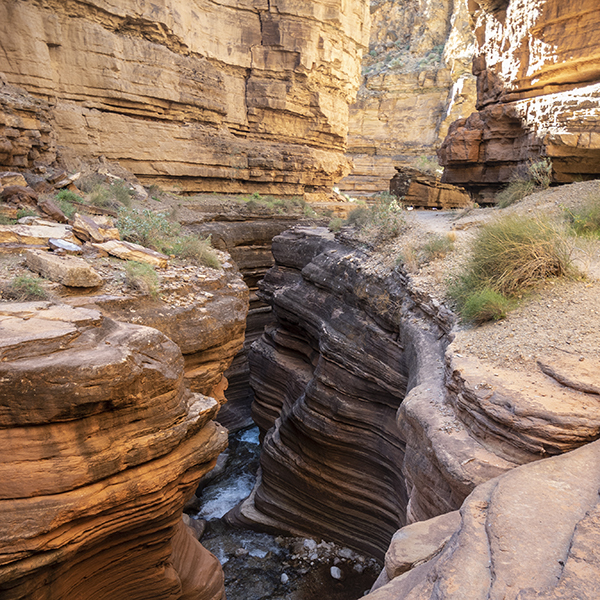 Tapeats Spring, which feeds Tapeats Creek, is the largest spring in the Grand Canyon. During springtime runoff, crossing it can be dangerous or impossible. Check with the park service prior to your trip for current conditions and flows. After strolling downstream for 2 miles, cross the creek again and continue on its west side the rest of the way to the Colorado River. When you’re ready to head over to Deer Creek, retrace your steps back to Surprise Valley. Follow the trail west across the undulating floor and down into the arm of Deer Creek. The trail becomes rough and loose as you near Deer Spring, a beautiful oasis (if it’s running). From the spring, it’s about a mile downstream to the campsite (AX7). Drop your pack, and continue down Deer Creek to a scenic section of narrows known as The Patio. If time allows, hike down to the Colorado River to see the spectacular Deer Creek Falls. Alternate option: There is an unmaintained route that runs along the Colorado River between Tapeats and Deer Creek. Experienced Grand Canyon hikers will be fine. There is one section with some exposure — ask the backcountry office for more information. Get an early start for your hike out, especially if it’s in the late spring or early fall when temperatures tend to bake you alive. If you stashed water on the Esplanade, be sure to pack out your jugs. Tip: Adding a 4th day to your itinerary allows more time to enjoy the shade, swimming holes, and waterfalls. Consider spending an extra night at the Deer Creek campsite (AX7), or having the fourth night be a dry camp (with stashed water) in Surprise Valley (AM9, at-large zone) or on the Esplanade (AY9, at-large zone). Note: Both Tapeats Creek and Deer Creek are popular stops for river trips. If hiking during the commercial season (late spring-fall), expect to see big groups of people near the Colorado River. Getting to the trailhead is a lengthy endeavor involving slow miles on washboard roads. Budget a day on each end of your trip for travel to and from the trailhead, and bring a Kaibab National Forest map (seriously, you’re going to want one). Don’t rely on cell service for navigation. From Jacob Lake, head south on Highway 67 to Forest Road (FR) 22, just past the Kaibab Lodge. Pull out your national forest map — the roads back here get confusing. Continue driving on FR 22, which turns into FR 222 as it heads west and eventually intersects with FR 425. Head north on FR 425. Turn left (west) on FR 292, and keep left at the fork toward FR 292A, which dead ends at Monument Point.